Jamil when we first met him in August 2017. 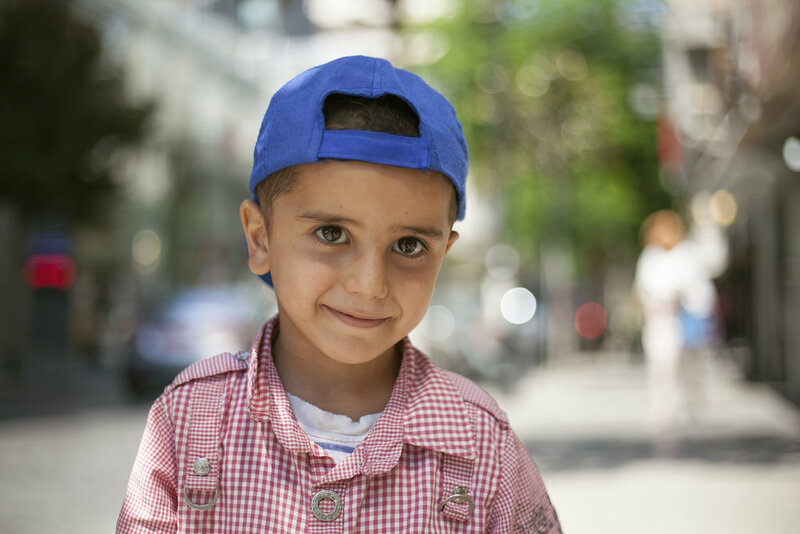 Jamil’s family has been on a long journey to get their son the treatment he needed. It’s been confusing for them as they went from organization to organization looking for help, travelling across Lebanon to find medical assistance. Luckily they no longer have to worry as their son is happy and healthy again. For the past four years they have lived in their tent, trying to get by as best they can. It was in March 2017 that Jamil was injured in their tent. His mother wanted to make tea for the children as it was cold. Rather than put the tea on the oven, to save on money for gas, his mother boiled liquid on their heater in the middle of the room. When she went out of the room to get cups for the tea she heard the noise of Jamil screaming and crying. She rushed in to find that he had knocked the boiling tea across his hands and elbow. “I immediately put cold water on them and contacted my husband and my brother,” his mother told us. They took Jamil to the nearest hospital, where they put a dressing on his burns and sent him home. For the next few months they kept taking him to hospital to get his dressing changed. However his burns soon became infected, and caused him to become extremely ill. They had to admit him into another hospital for ten days. After ten days, their money had fast run out and they couldn’t afford to keep him in any longer. They were told that there was a good traditional doctor that they could approach, and he recommended a number of herbal treatments on the wounds. Again, this didn’t work and Jamil’s wounds were still not healing. They took him to another hospital, who referred the family to an organization who might be able to help. He had a scar revision surgery to release the contracted skin on his elbow in a hospital in Beirut, but this wasn’t successful. At this point, Jamil’s parents were exhausted. The past few months had been filled with anxiety and mixed messages about what medical treatment their son would need. It seemed that nothing was working out, and they didn’t know who else to turn to. But there was some hope left. A doctor at the Union of Relief and Development Associations (URDA) recommended that they contact INARA. We immediately booked Jamil in for an assessment with our doctors at the American University of Beirut Medical Center (AUBMC). Our doctors provided Jamil with three surgical procedures that they did in one operation in August 2017. The first two procedures were on both his hands to release the contraction on his fingers. The second was a scar revision surgery on his left elbow. After everything the family have been through, they were still anxious that the operation wouldn’t work. However, it was a success and full mobility has been restored to his hands and elbow. “All I wish is for Jamil to live a normal life just like other children in this world,” his mother tells us with a smile on her face as she discharged her son. After many months of worry, the fact that her son is no longer in pain is a huge relief for her and the entire family. UNICEF contributed to Jamil's treatment.